Refine your technique: check your own foot positions, even without a mirror. More Belly Dance Variations "on the floor"
Let’s examine another variation: how we use the Wide Stance as only belly dancers do: in our gorgeous hip circles! Even in my beginner class there’s a couple of advanced moves I introduce right away, and the hip circle is one of them. I consider it an advanced move because to do it well involves a lot of body control while the body is in an unusual position; and that’s one reason I start it so soon. 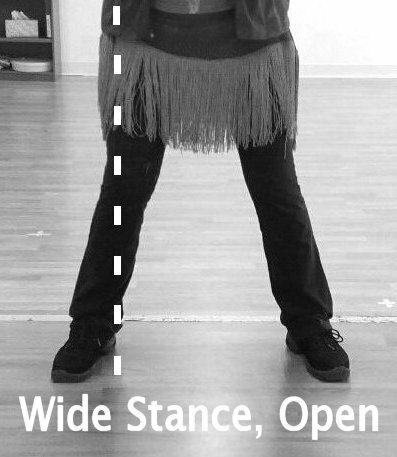 Most new dancers are comfortable with that position, and can begin learning small hip circles by using this awareness. The wider position often seems less comfortable for them, not physically, but mentally. By “wider” I mean taking the Basic Wide Stance from just past the width of our shoulders to completely past our shoulders on each side, with a couple of inches to spare. Tip: Even if you have a mirror to look into, do this: open your stance and look down: see your foot position relative to your shoulders. I like measuring with this “body gauge” rather than with inches, as we so often hear (“place your feet about 6-8 inches apart”). Who’s carrying a ruler? In the photo “Wide Stance, Open”, above, I’ve drawn a line from the edge of my hip (the same width as my shoulders) down to the floor, to illustrate the relative position. This clearly shows where the hip has to move to go past the feet on each side. This is a body position we usually don’t do in everyday activities, and getting beginners to “go there” is a “big step” (no pun intended!). This position is usually out of people’s comfort zone at first, so I always tell new students what cool belly dance moves are done in this position, i.e. the large hip circle with torso drop. 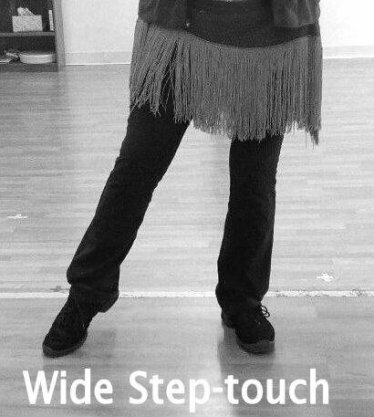 The “Wide Stance” position is also used moving through space - very often with veil work - but as a “Step-touch”, above (and often crossing over from side-to-side). The term “touch” signifies a non-weighted foot on the floor, as opposed to a “step” which carries weight. If you do hip work in the Wide Stance position, I recommend using more floor contact with the non-weighted foot than just the toe. In the next article: the advanced foot position of “releve” as it’s used in belly dancing.